Home Islam Prophet's Stories How was Hazrat Musa A.S. grown up in the House of Pharaoh? How was Hazrat Musa A.S. grown up in the House of Pharaoh? Also, both sources have revealed interesting stories of some of the Prophets. Here we will share some incidents and authentic stories of Hazrat Musa A.S.
We have already shared the story of Hazrat Yousuf A.S. in previous articles. How he was taken from Palestine to Egypt as a slave. His solid character made him the governor of Egypt. He made arrangements to settle down his family and his father Hazrat Yaqoob A.S. in Egypt. The family of Hazrat Yaqoob A.S. had opted to start a life in Egypt. They tend to stay there permanently and soon they increased in number. Their families grew and their population was called as Bani Israel. However, the Egyptians did not like people belonging to Bani Israel. With the effect of new Firawn, Bani Israel was treated as slaves. They were to do unpleasant jobs. The new government forced them to do the low-level chores. Bani Israel was treated very badly. Firwan had a strange dream one night. Haman, who was his high Priest, interpreted the dream. He told that an Israeli boy would grow up and would be the cause of Firawn’s death. Firawn got angry and decided to kill all the boys that would be born in Bani Israel and his dream would never come true. Imran and his wife had been blessed with two children: Maryam and Iram. The firawn horrible plan was soon disclosed at it made Imran’s wife worried as she was expecting a baby. She was worried that if the baby turned out to be a boy, he shall be killed. Thereby she did not reveal that a baby would be born to her and stood at home until the baby was born. It was a boy! Her fears became a reality; the baby shall be killed at the orders of Firawn. 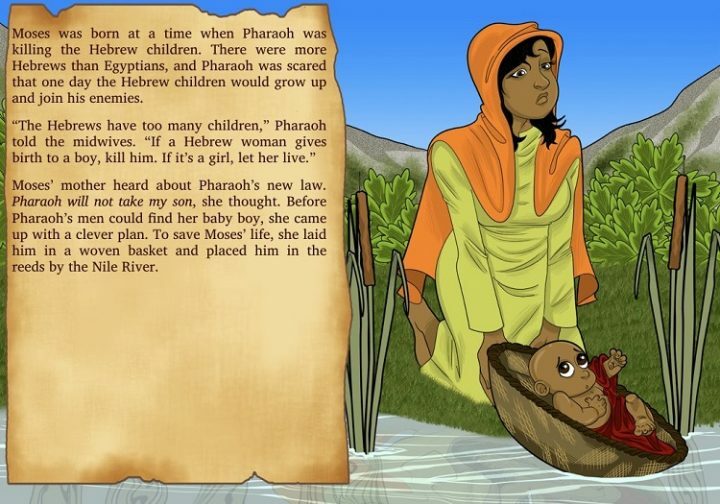 She did not want this to happen and thereby placed the baby in a special box and let it sail in the river Nile on the orders of Allah. She and Maryam would pray for the safety of the baby and their prayers were accepted. Allah did not provide any harm to the baby and it safely sailed to the gardens of Firawn. The maids saw the box and were surprised to see a baby in it. The baby was then taken to Hazrat Asya A.S, the Firawn’s wife. Hazrat Asya A.S was in love with the baby and appealed to Firawn not to kill him as they were sure that the baby belonged to Bani Israel. Firawn let Hazrat Asya A.S adopt the baby. She named the boy as Musa. The baby was hungry and needed milk. He was not taking milk from anyone. Maryam saw this and told them she knew someone who could help in raising the boy and feeding him the milk. She went home and told her mother everything. Maryam and his mother went to Asya and took the baby in their hands. Hazrat Musa A.S stopped crying as soon as he was taken in his mother’s arms and took the milk from her. This way Allah reunited Hazrat Musa A.S and his mother! Hazrat Musa grew up in the house of Firawn just like his own son. Firawn who killed thousands of boys in Bani Israel didn’t know that the only one he spared would cause the reason for his downfall. There is a lesson in the story that everything is possible for Allah.